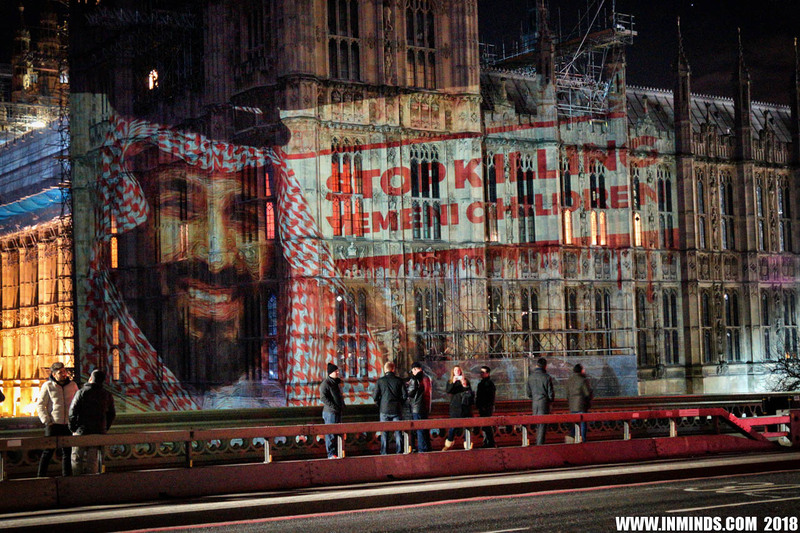 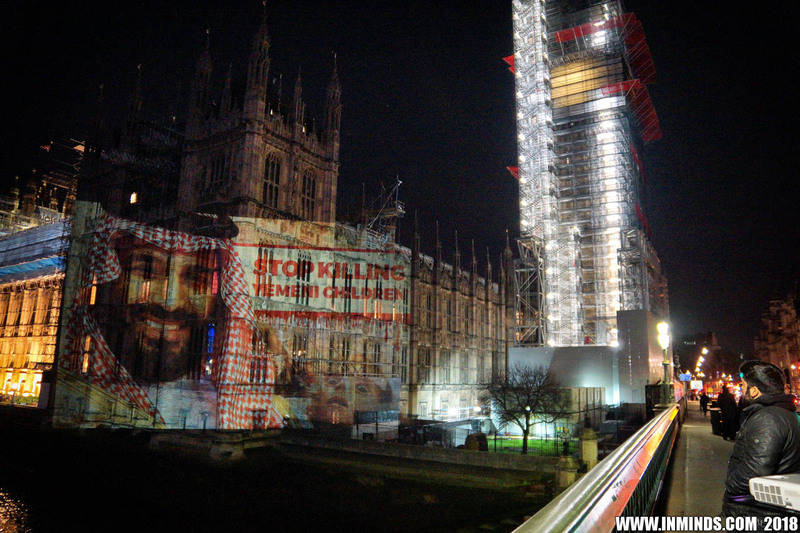 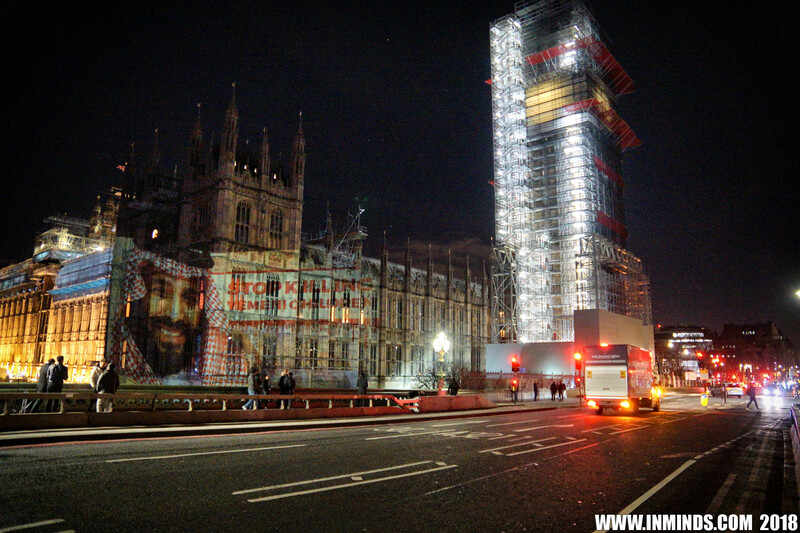 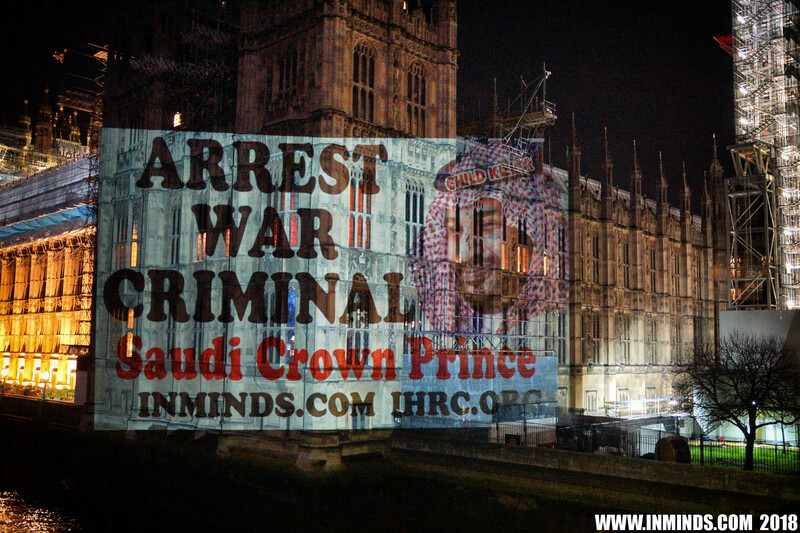 To protest the visit of Saudi crown prince Mohammed bin Salman to the UK, Inminds Human Rights Group along with the Islamic Human Rights Commission undertook a guerilla projection on the walls of the Palace of Westminster, the seat of the British government, on Thursday 8th March 2018 to demand the arrest of the Saudi crown prince for war crimes in Yemen and human rights abuses in Saudi Arabia, and to demand the UK stop arming Saudi Arabia. 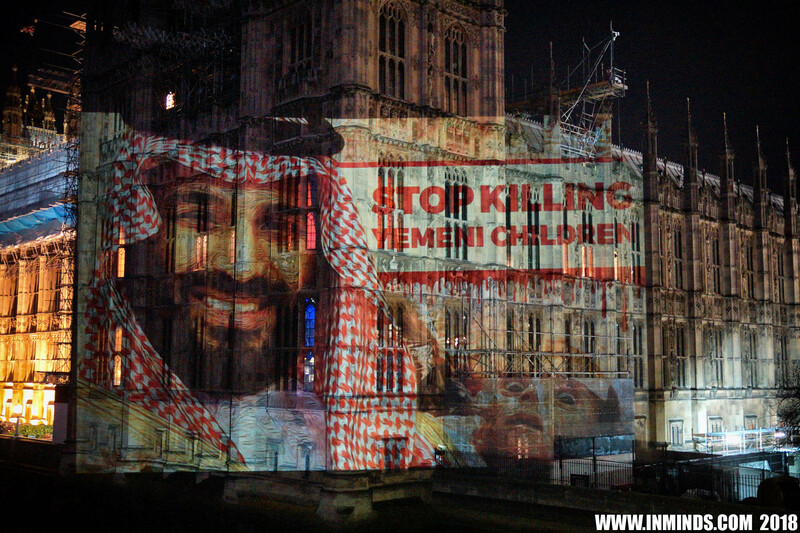 Mohammed bin Salman is the de facto ruler of Saudi Arabia and the the architect of its genocidal war on Yemen. The Saudi coalition of local dictators from oil rich states armed to to the teeth with billions of dollars worth the most sophisticated US and UK weaponry began their genocidal attack on the poorest country in the region, Yemen, 3 years ago. Figures for 2015-2016 show that out of over 15,000 Saudi air raids on Yemen only a third by any stretch could be construed as military targets. 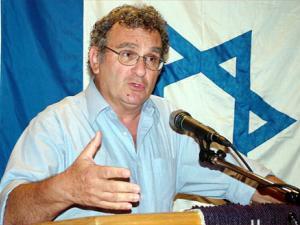 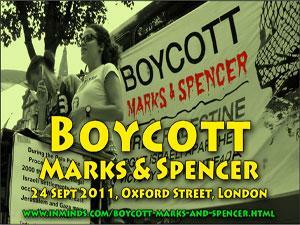 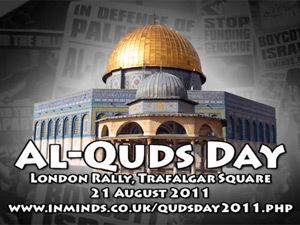 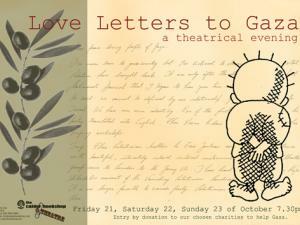 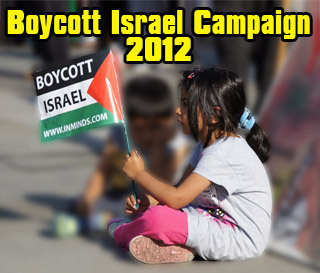 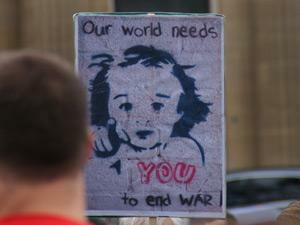 Other bombings targeted schools, hospitals, farms, water and electricity infrastructure and food storage facilities. 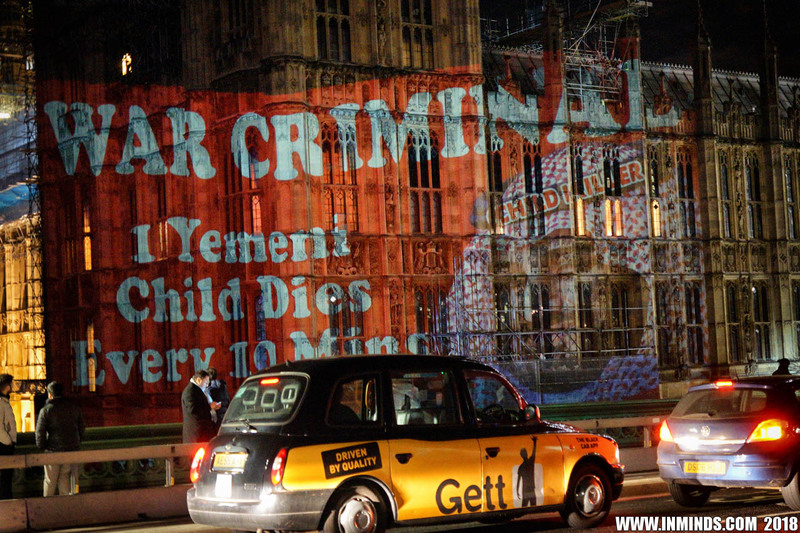 Tens of thousands of Yemeni's have been killed. Not content with bombing Yemen, Saudi Arabia is using starvation as a weapon of war. 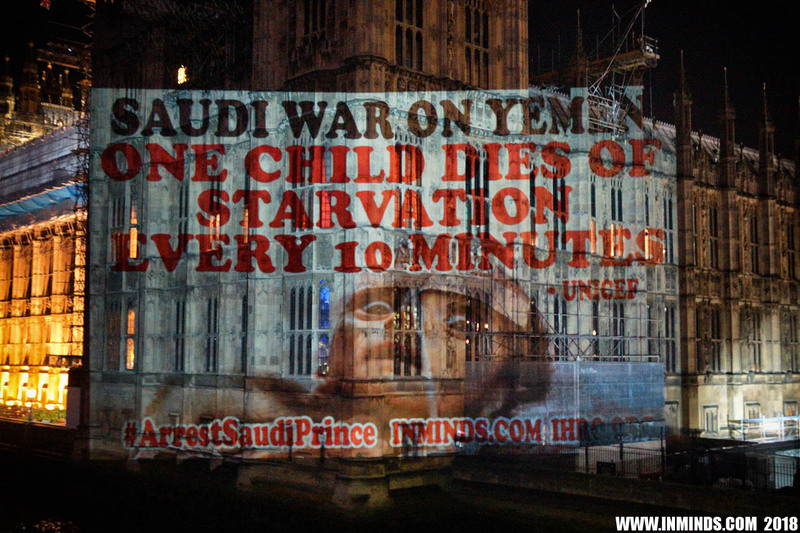 Yemen imports 90% of its foods, the Saudi coalition's land, air and sea siege of Yemen has resulted in mass starvation, with the UN reporting that 3.3 million Yemeni's, including 2.1 million children, are suffering severe acute malnutrition. UNICEF reports that one Yemeni child dies every 10 minutes due to starvation and diarrhoea. 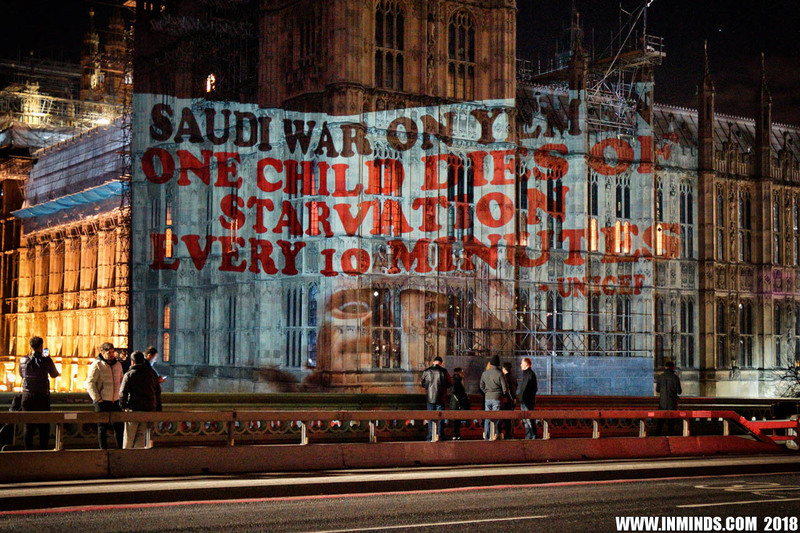 With Saudi air strikes targeting Yemen's infrastructure, water and sanitation systems have collapsed - with no clean water available. This has resulted in the worst cholera epidemic in history with over a million cases including over 600,000 children being infected. 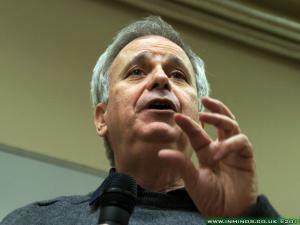 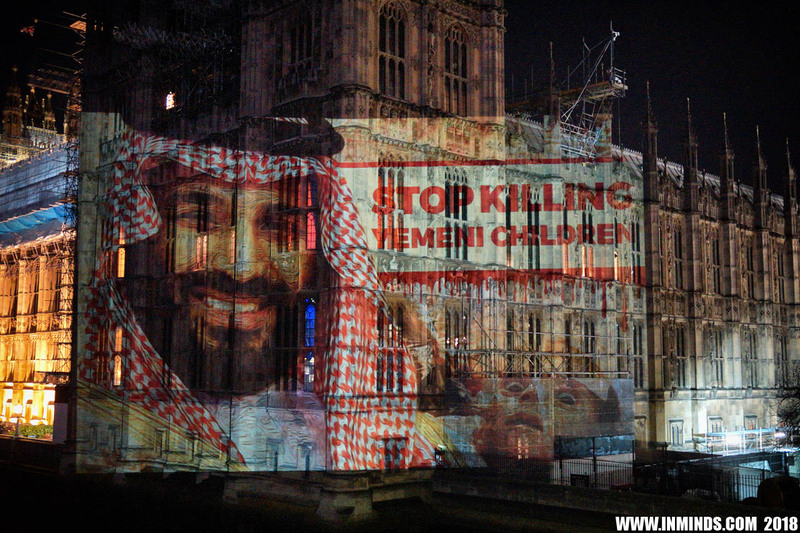 The World Health Organization has reported that 4,000 new cases are reported every day, and according to Oxfam this man-made epidemic is killing one person almost every hour. 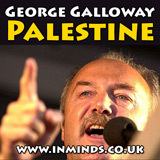 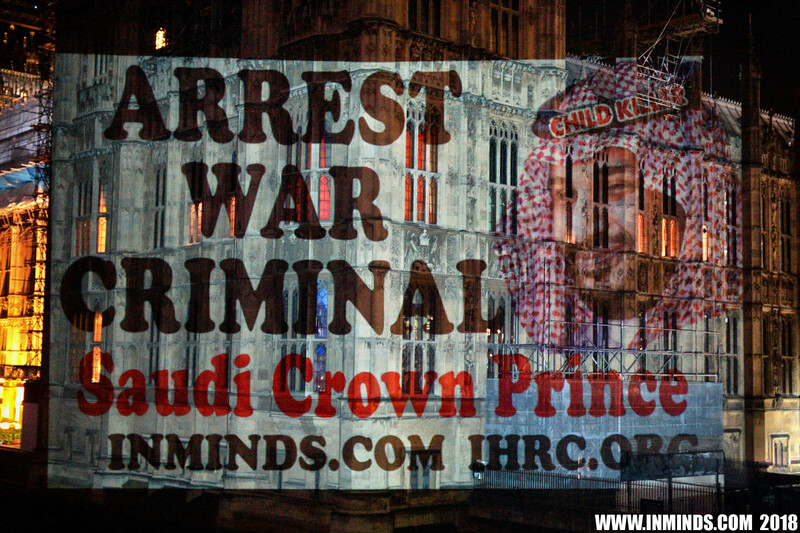 Inminds chair Abbas Ali added "We are here to show our disgust at Theresa May's decision to roll out the red carpet to welcome this Saudi war criminal. We are here to say 'not in our name' and to demand justice for the victims of Saudi brutality including Sheikh Nimr al-Nimr who was executed by the Saudi dictatorship in January 2016 for demanding human rights for all citizens. We are here to demand the arrest of the Saudi crown prince for crimes against humanity in Yemen. And we are here to demand Britain stop providing Saudi Arabia the weapons it uses to slaughter the people of Yemen. 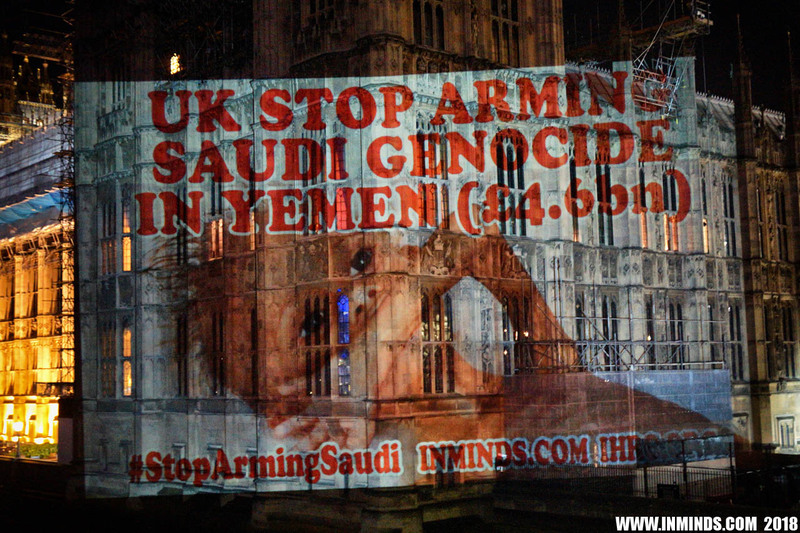 Since the slaughter began 3 years ago the UK has already provided £4.6 billion worth of arms to Saudi Arabia to help its genocide in Yemen, making the UK a partner in those war crimes." 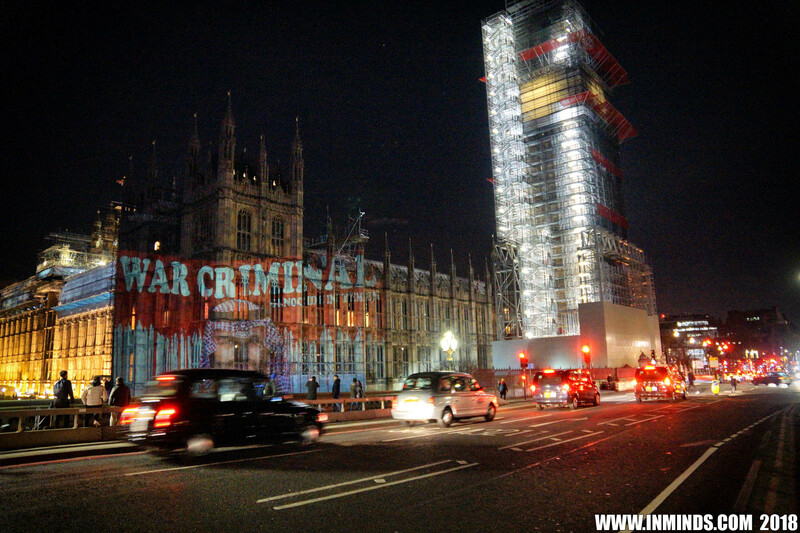 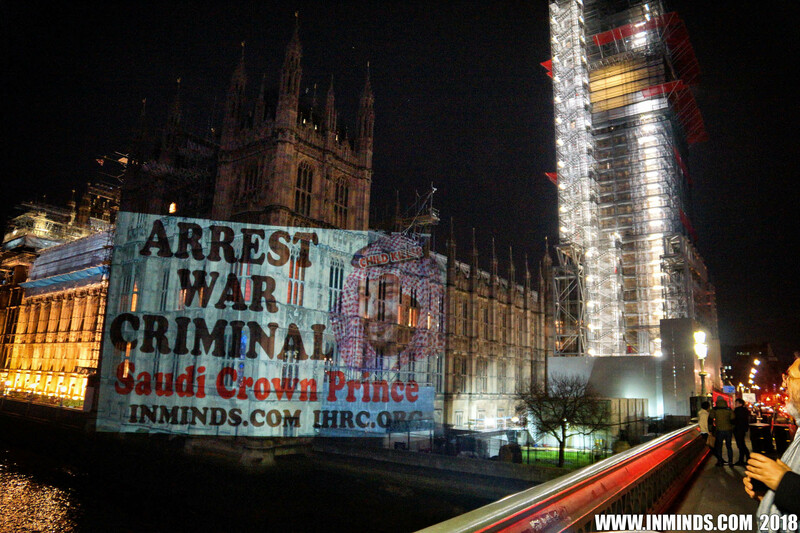 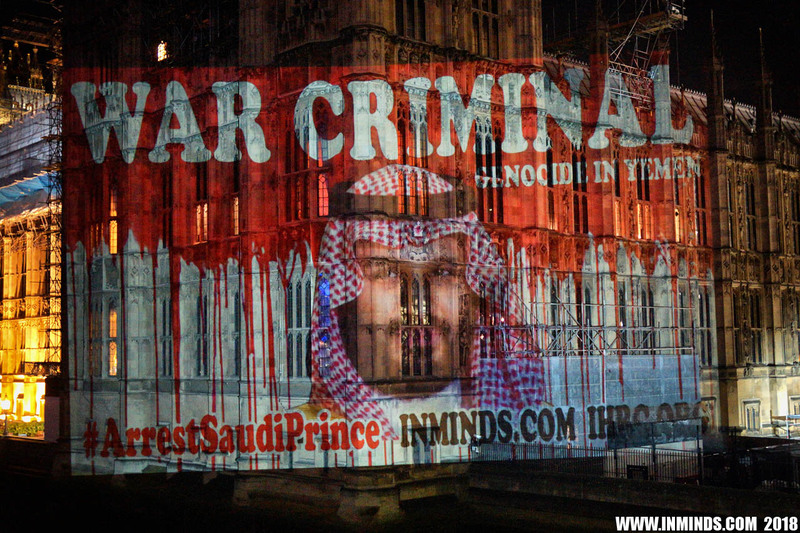 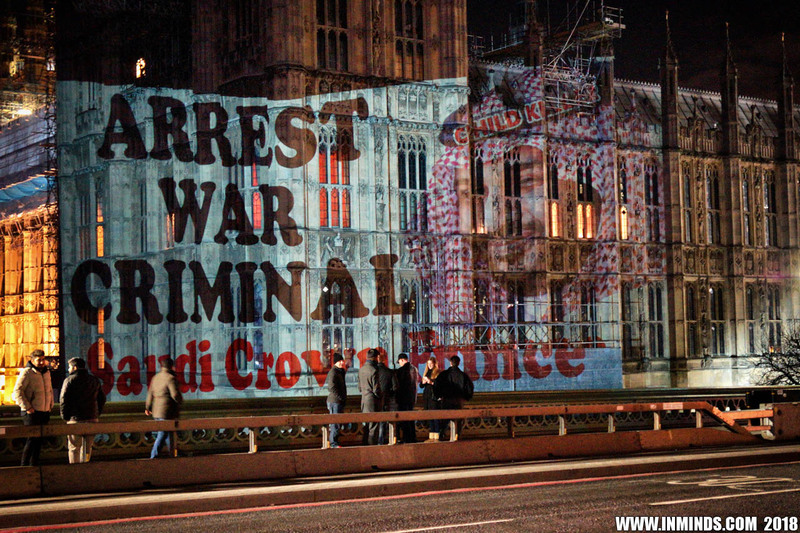 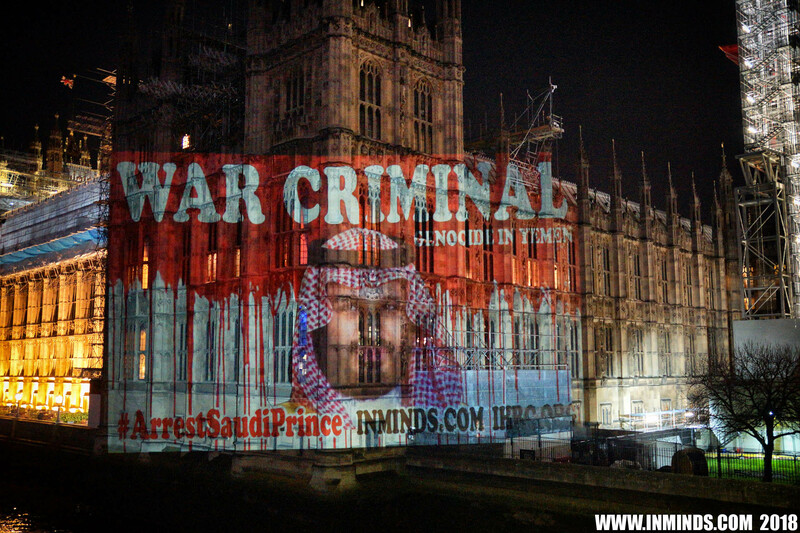 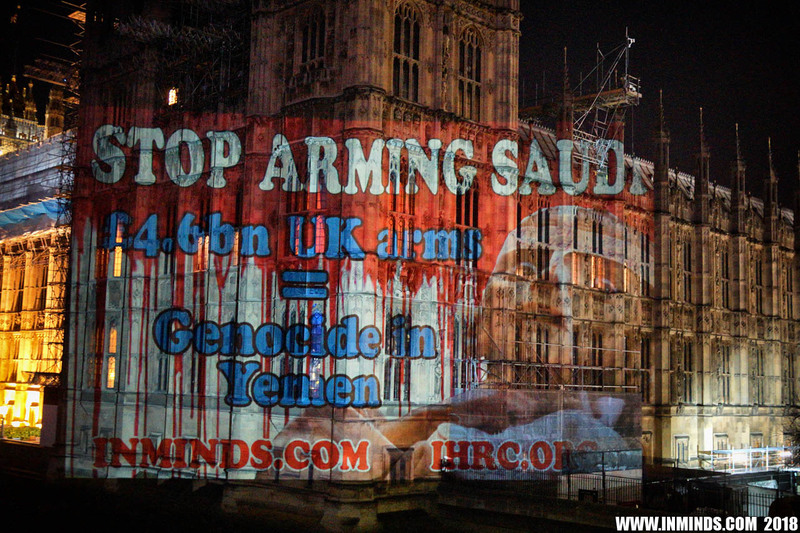 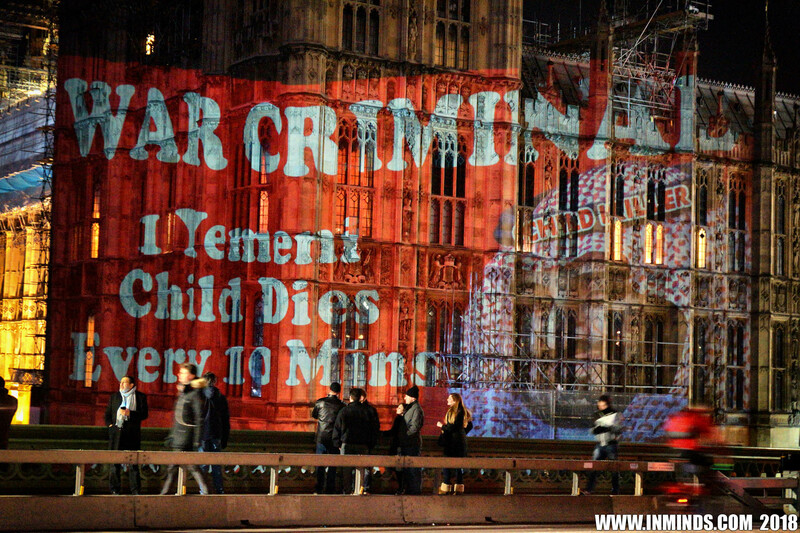 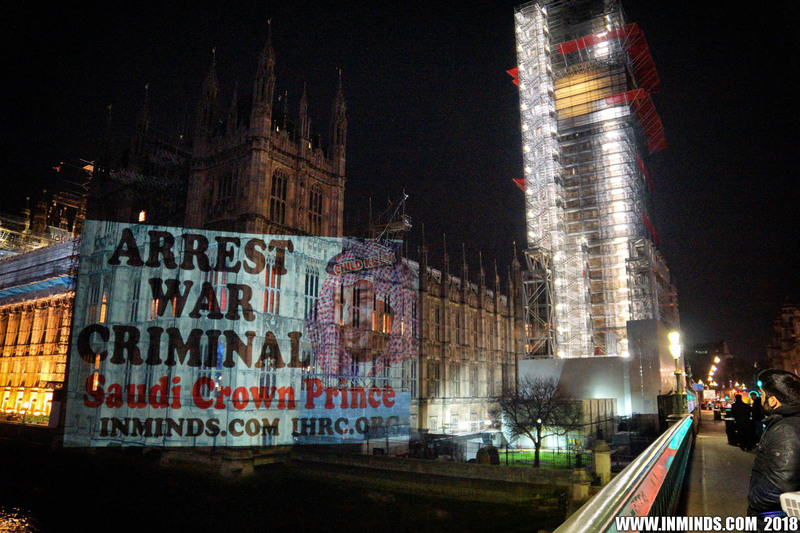 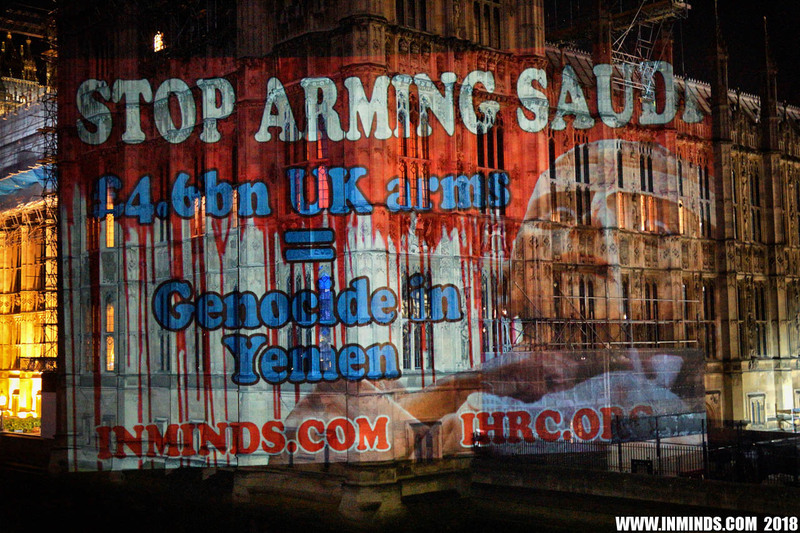 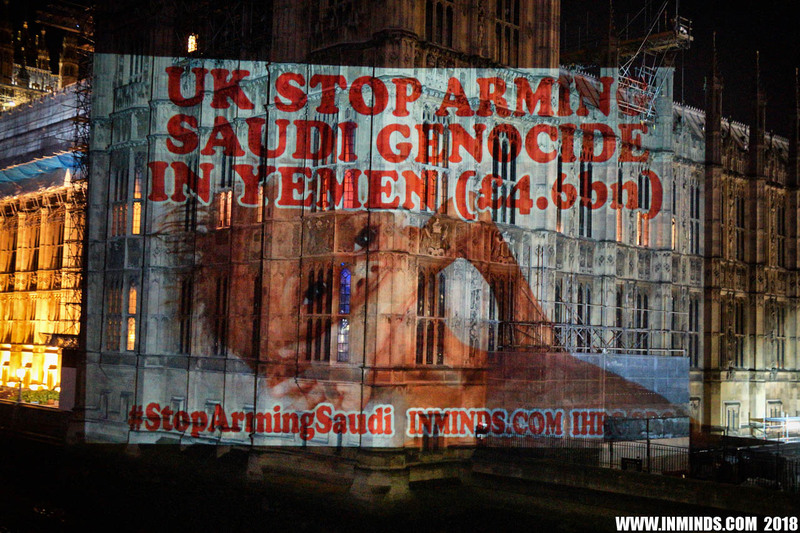 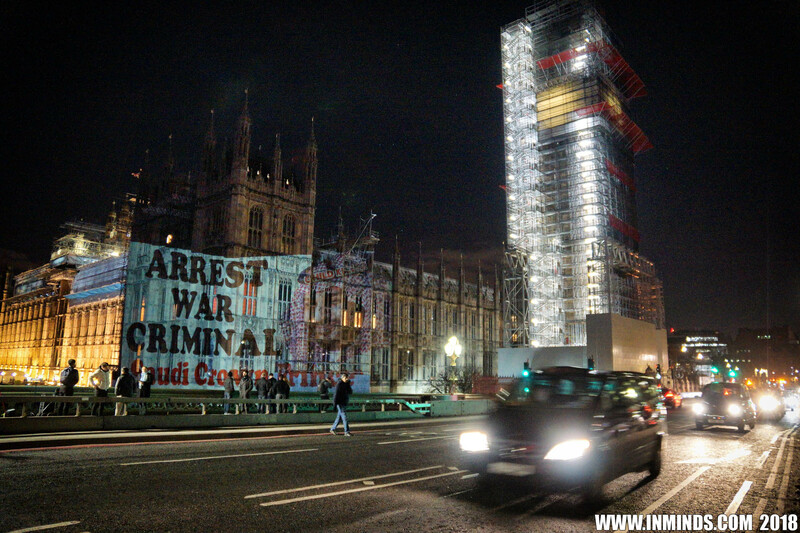 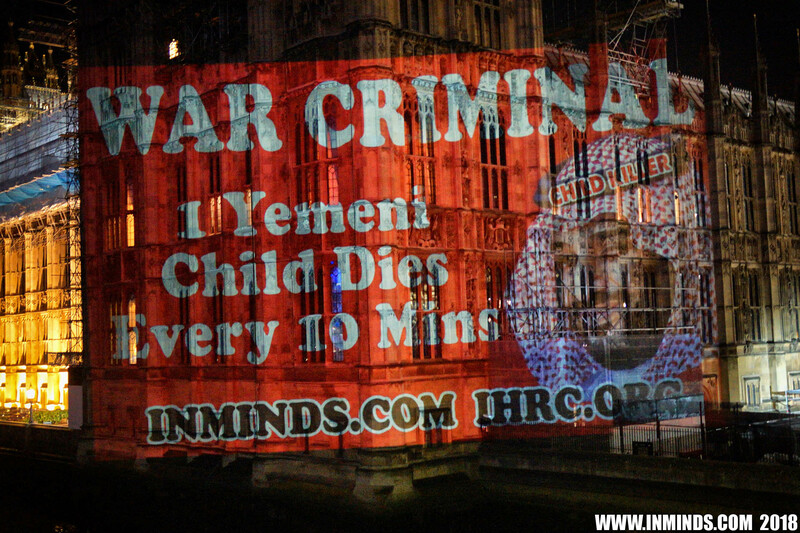 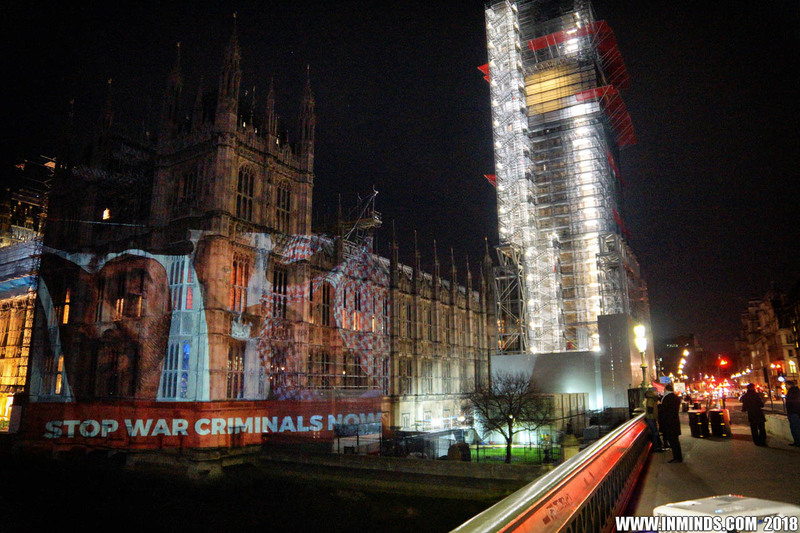 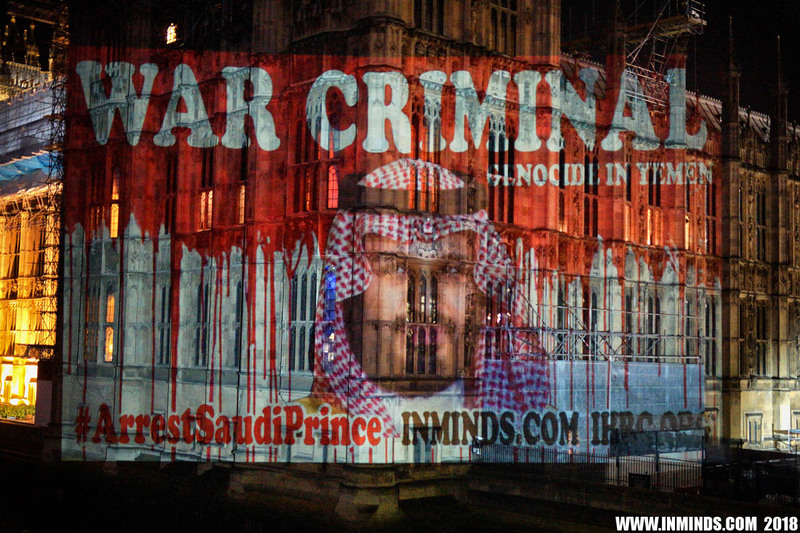 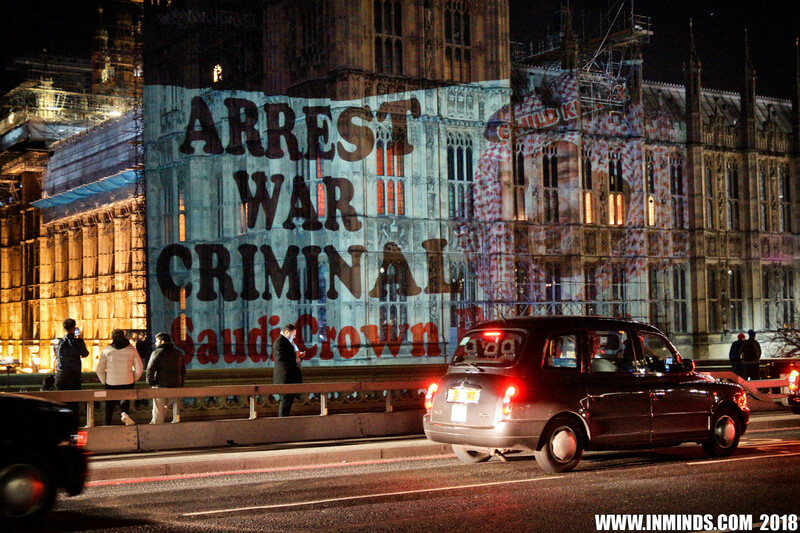 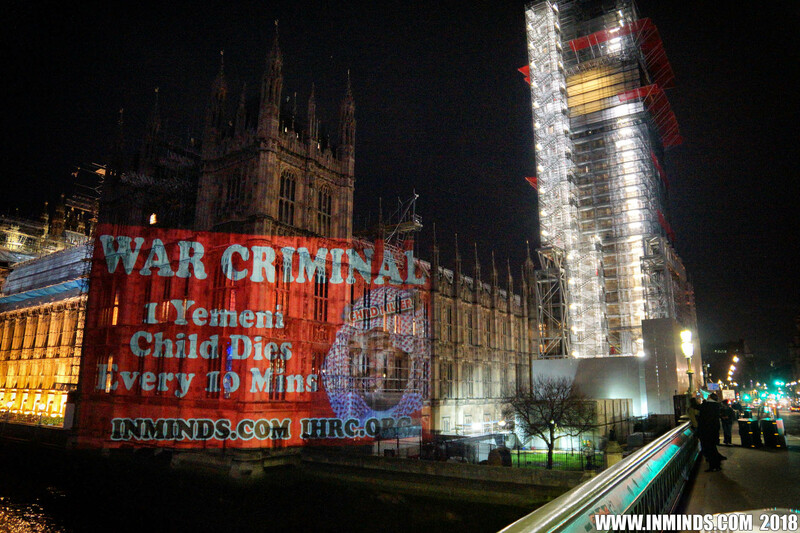 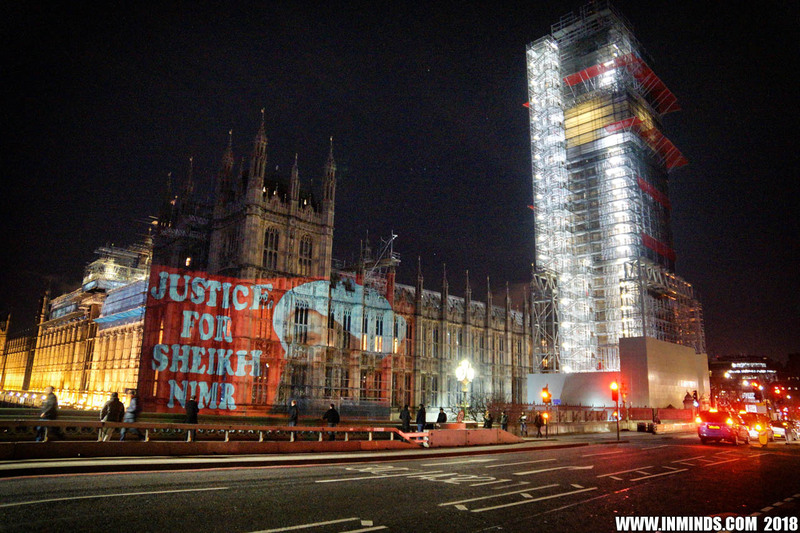 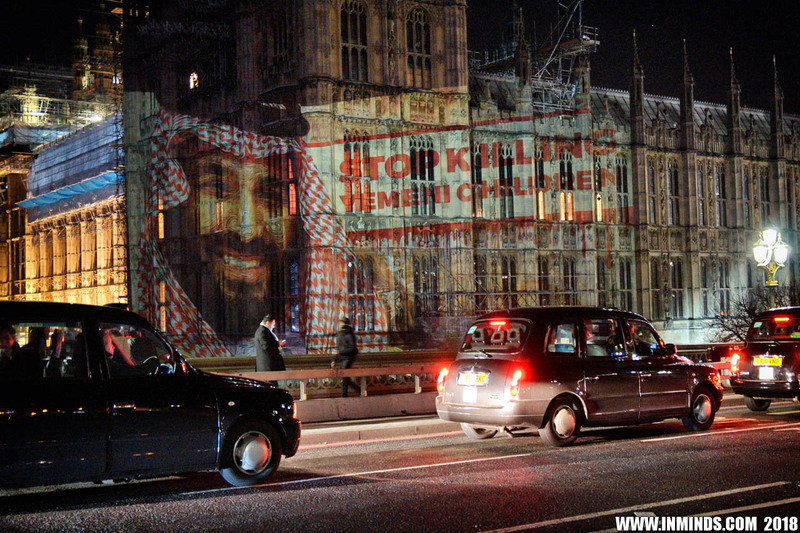 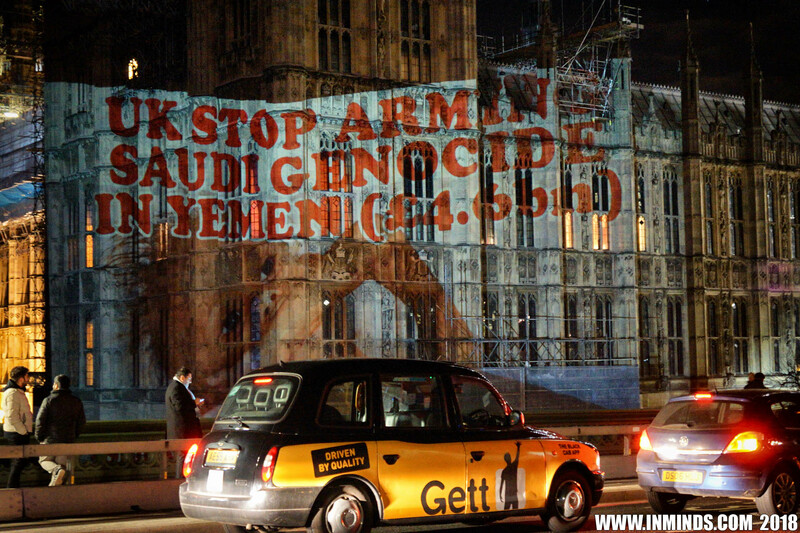 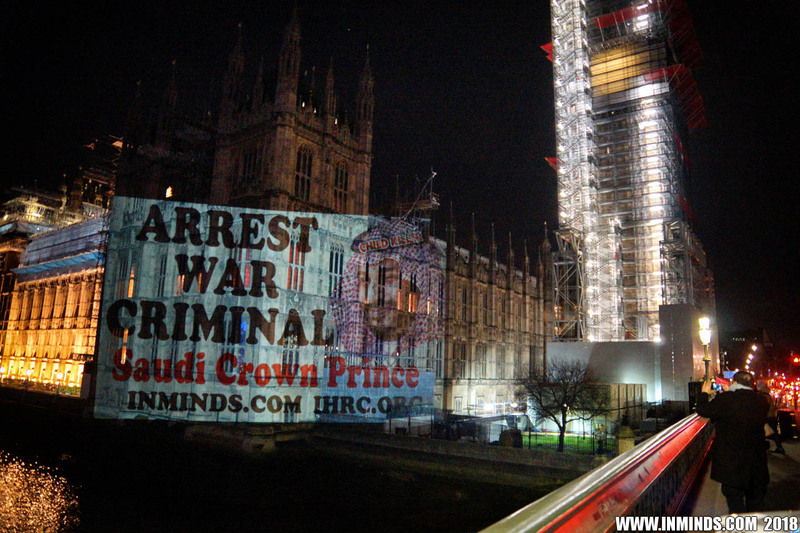 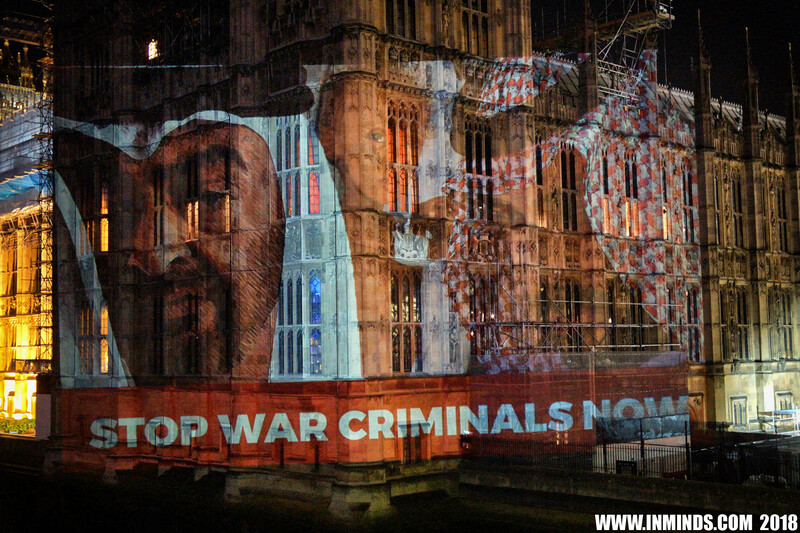 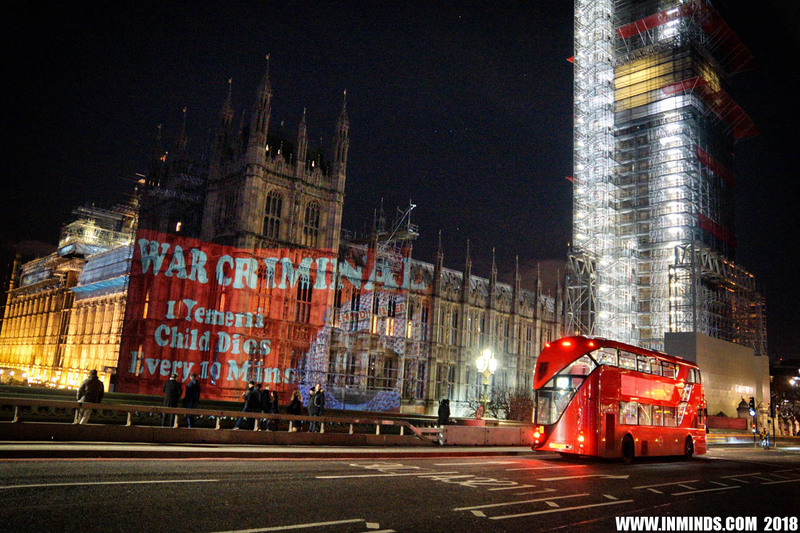 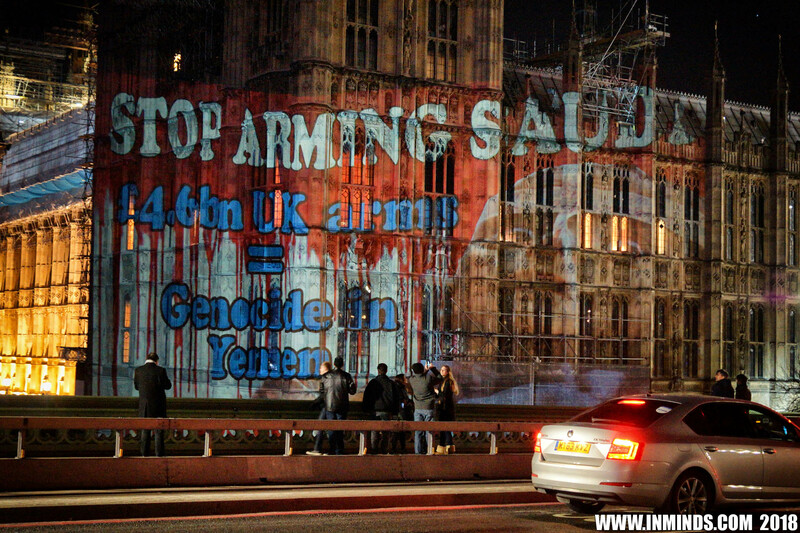 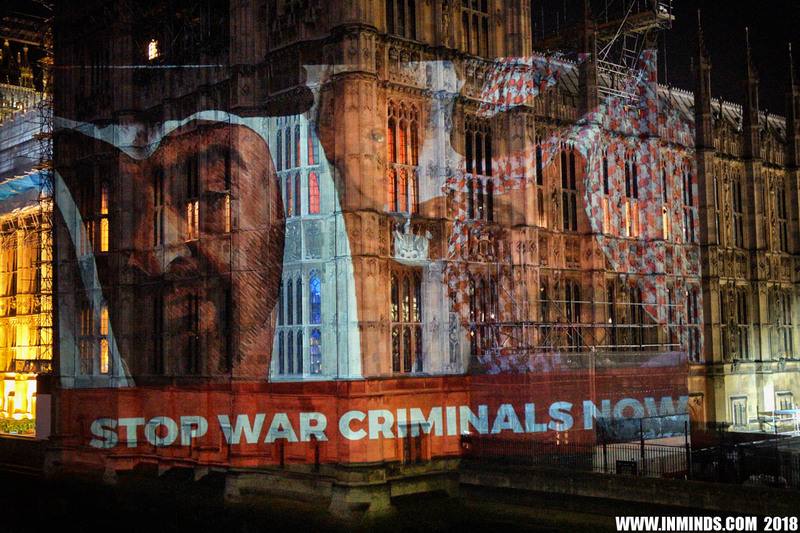 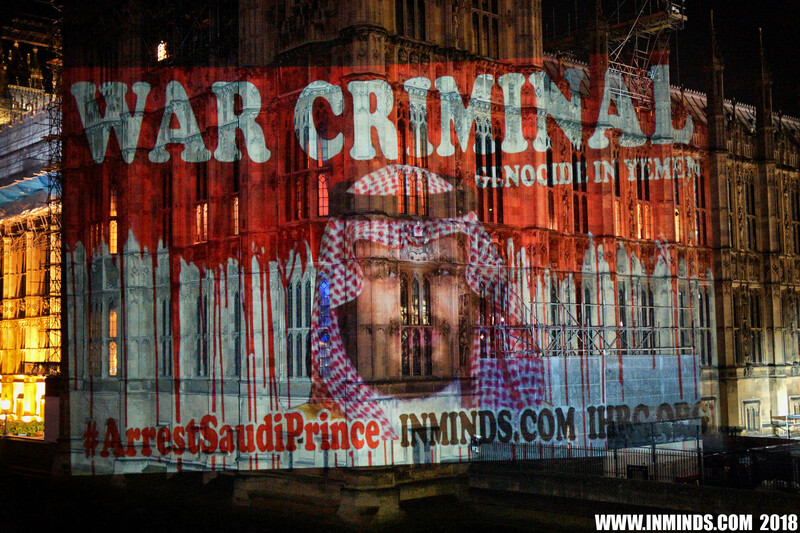 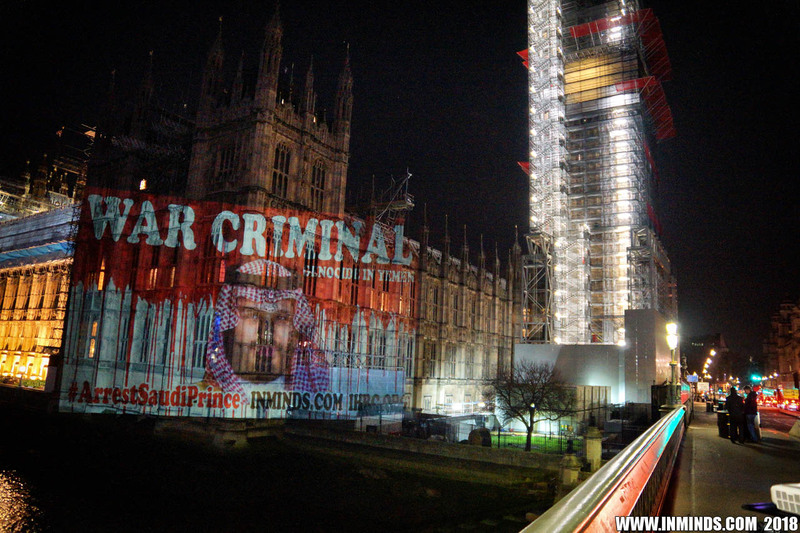 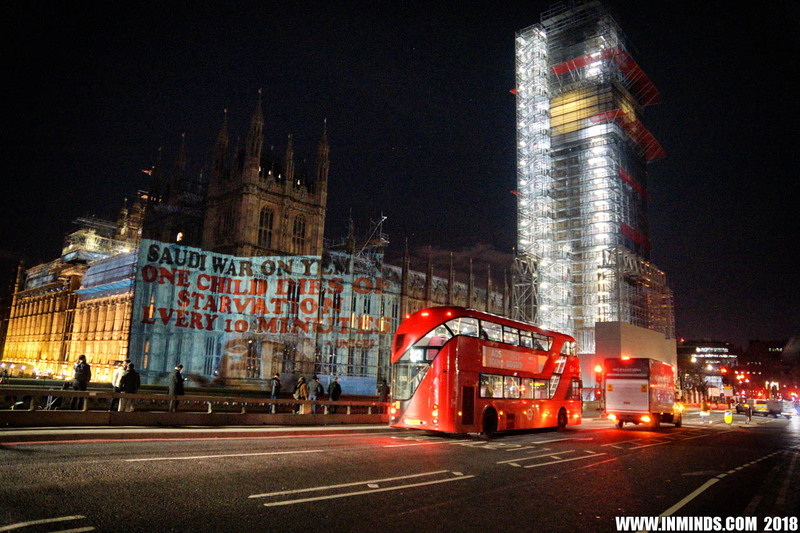 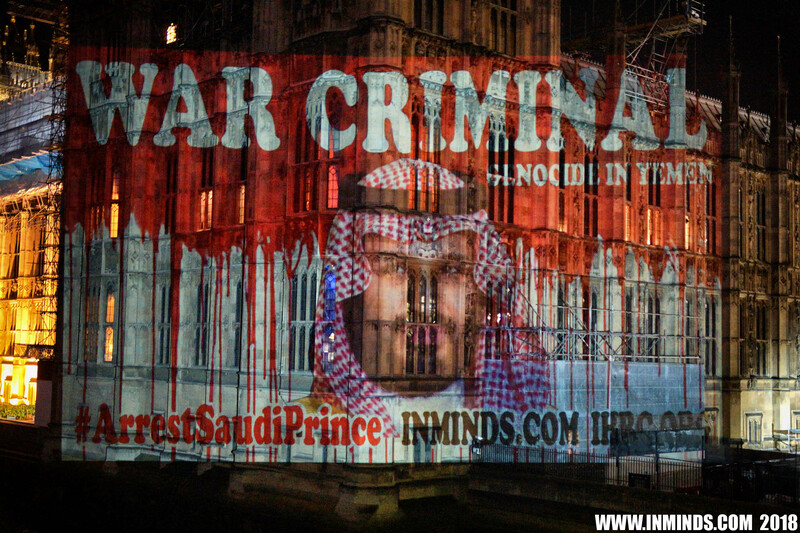 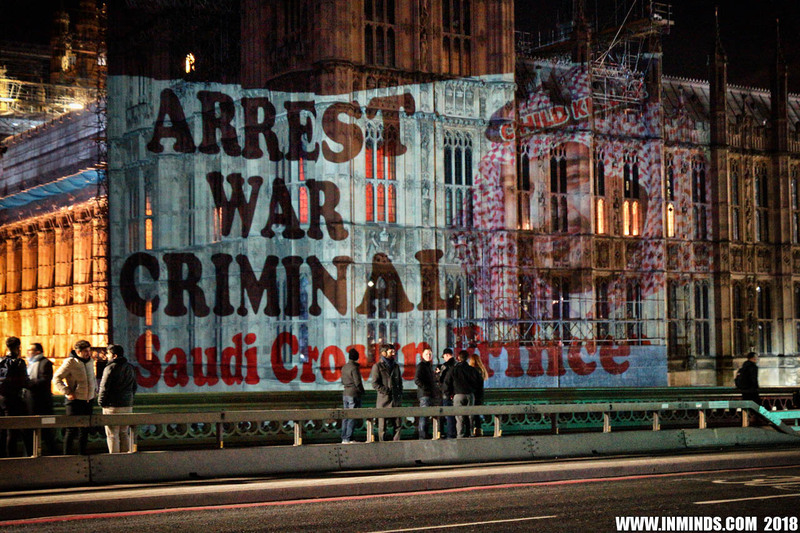 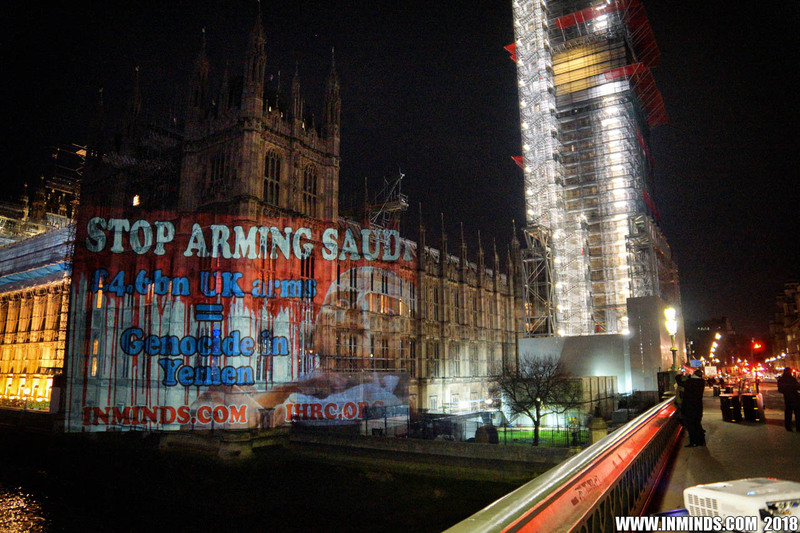 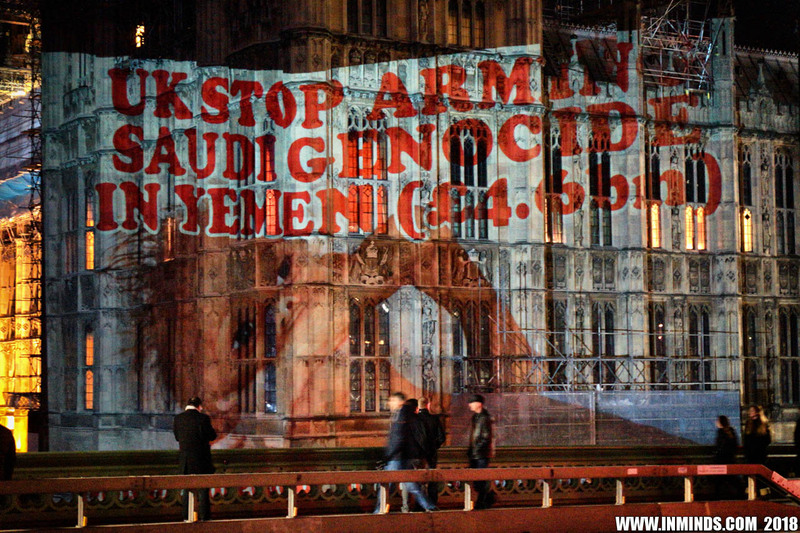 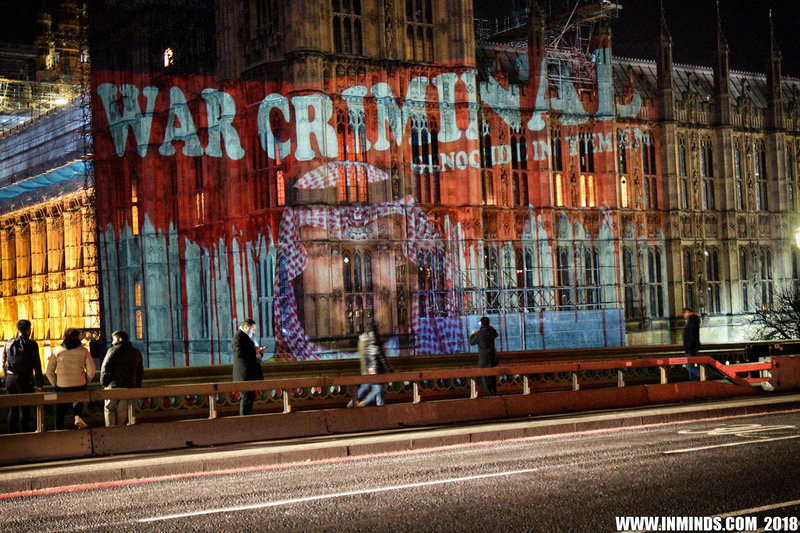 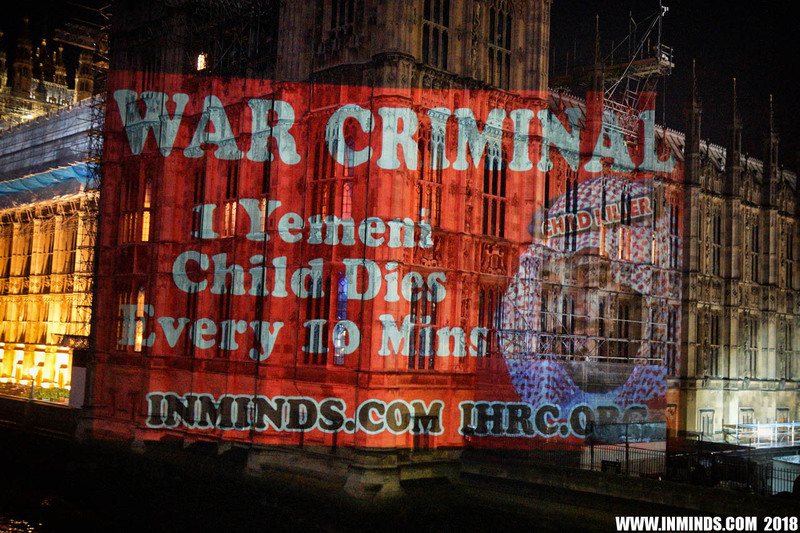 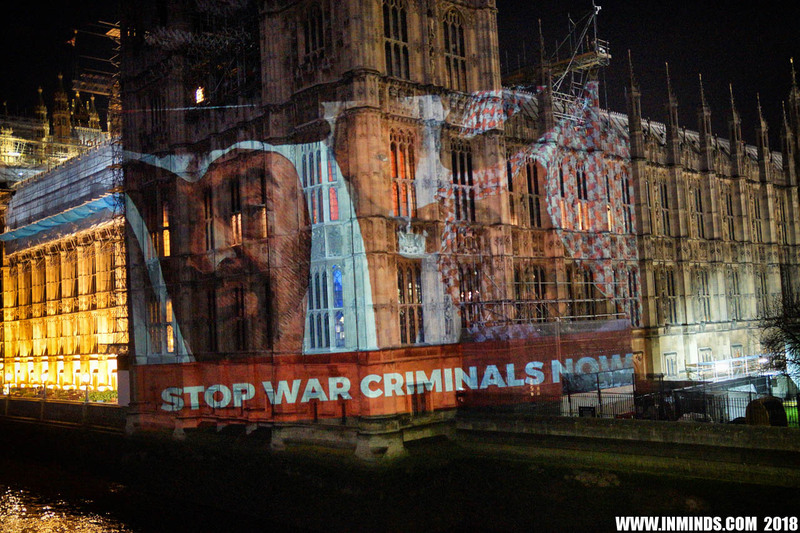 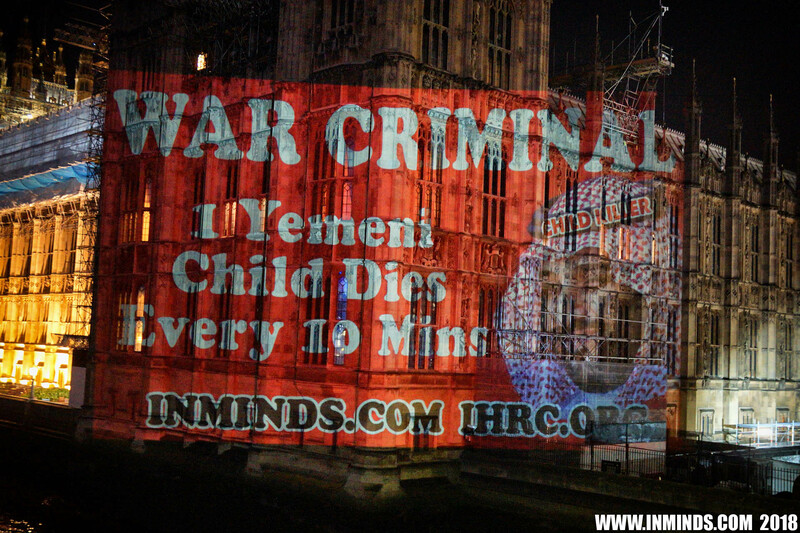 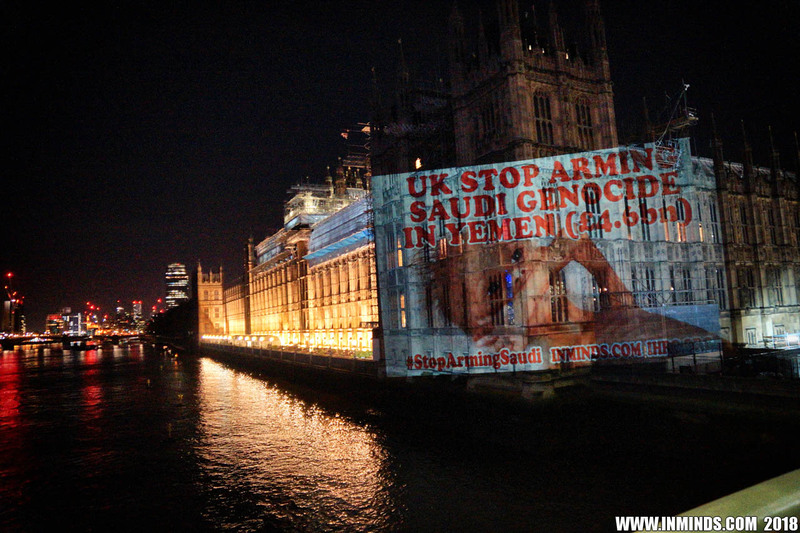 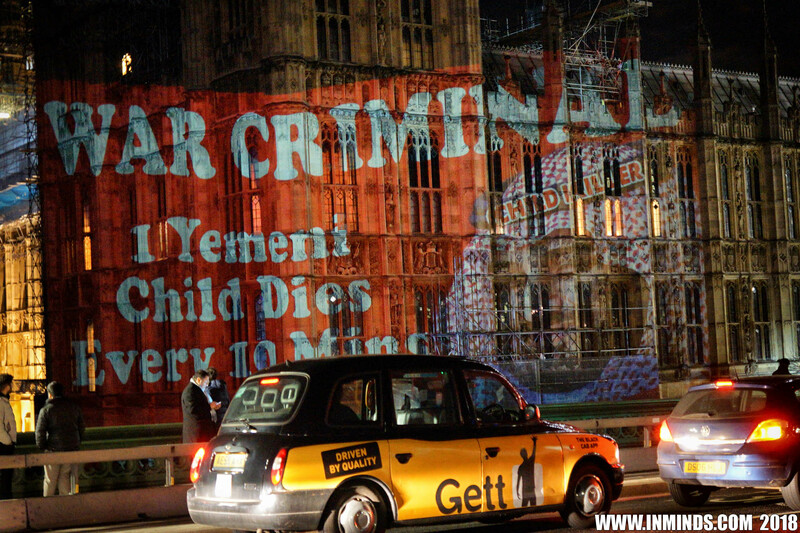 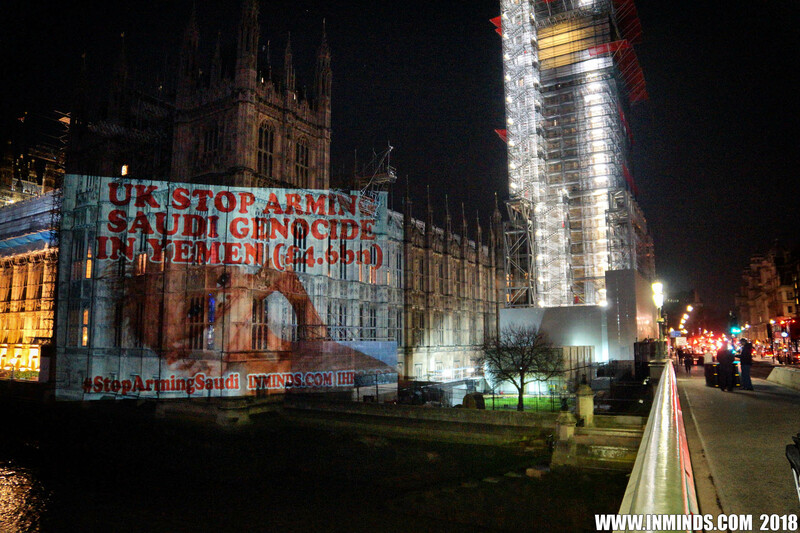 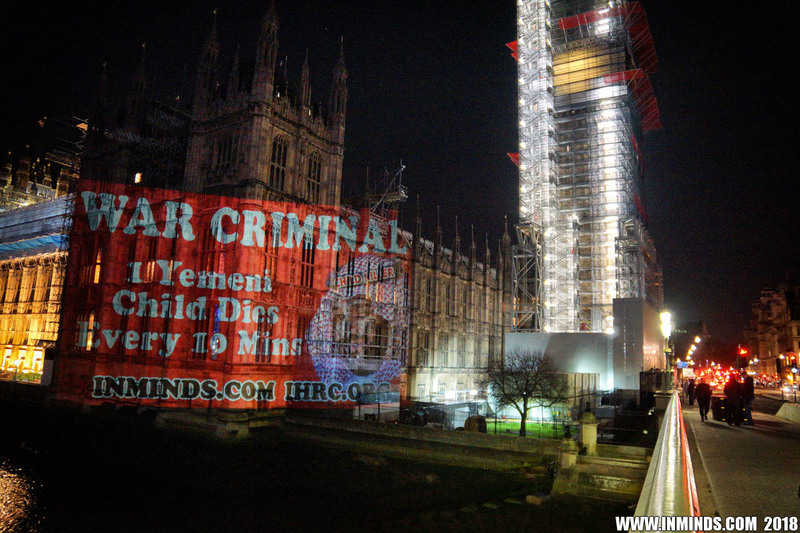 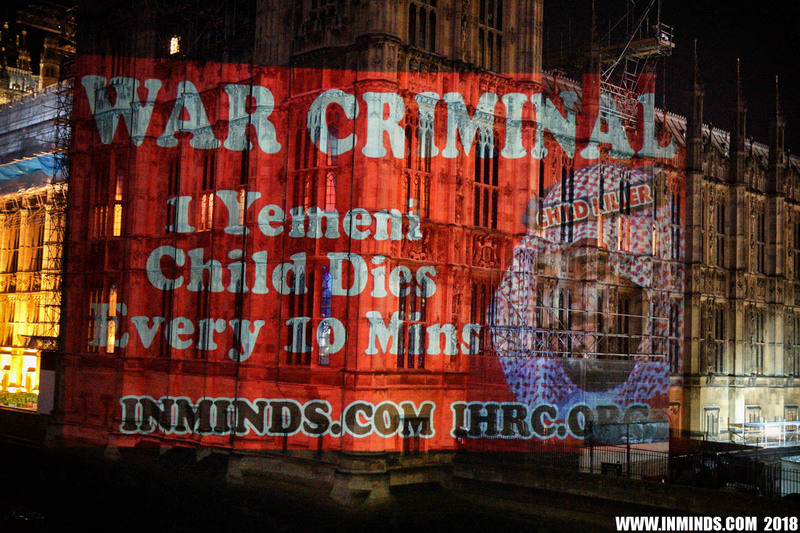 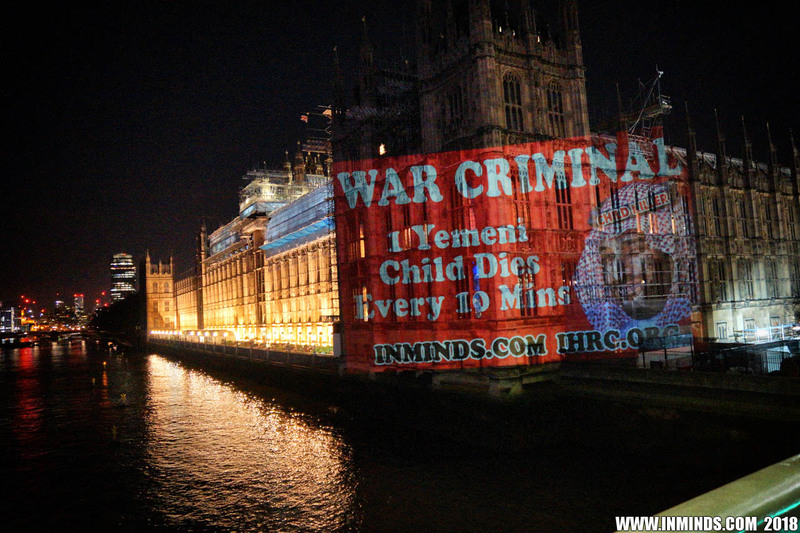 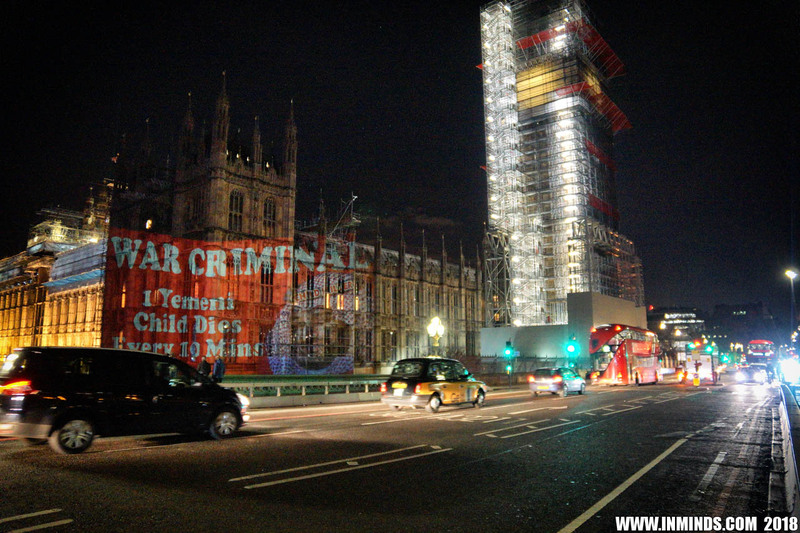 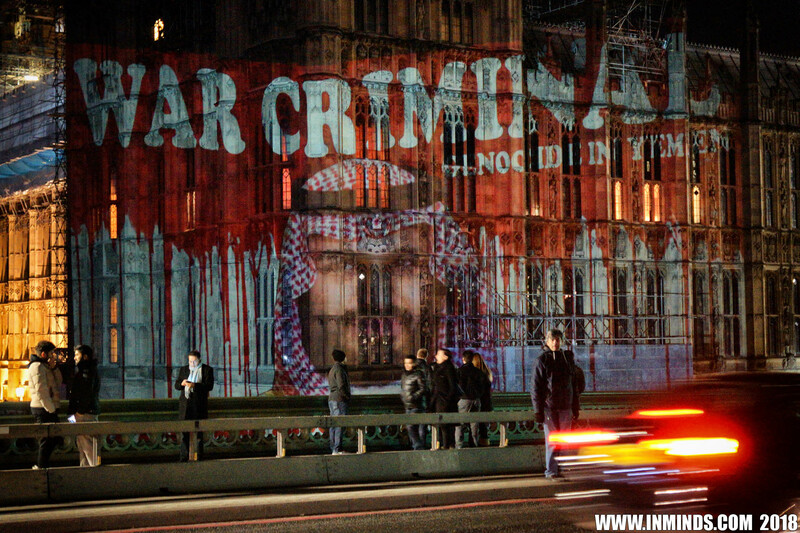 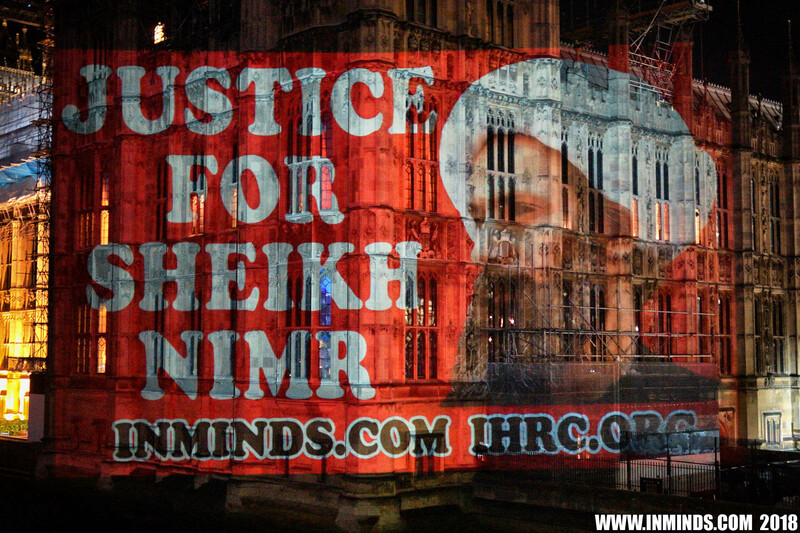 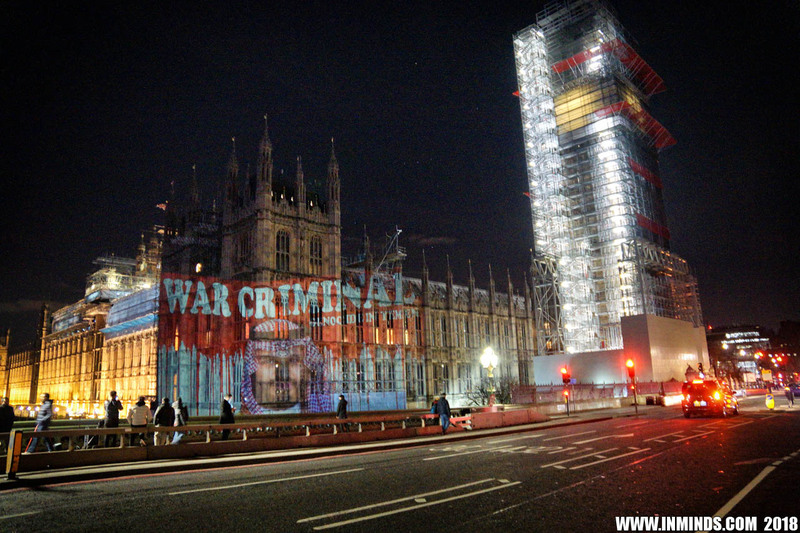 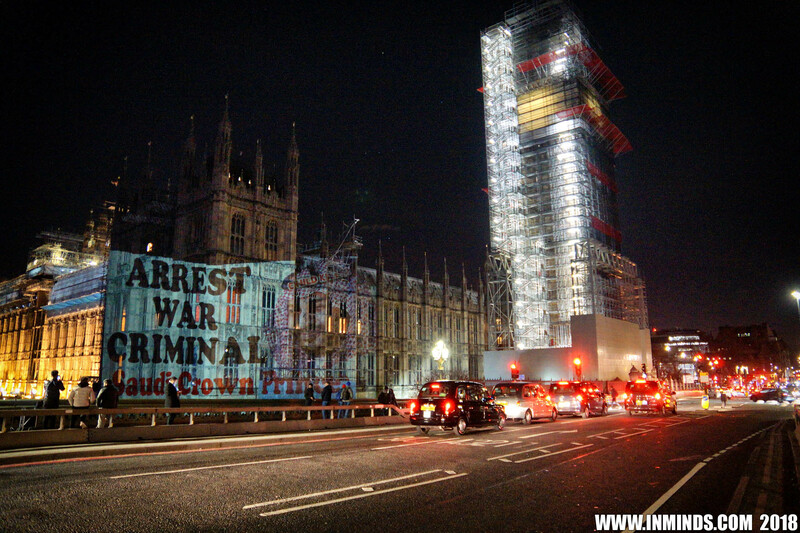 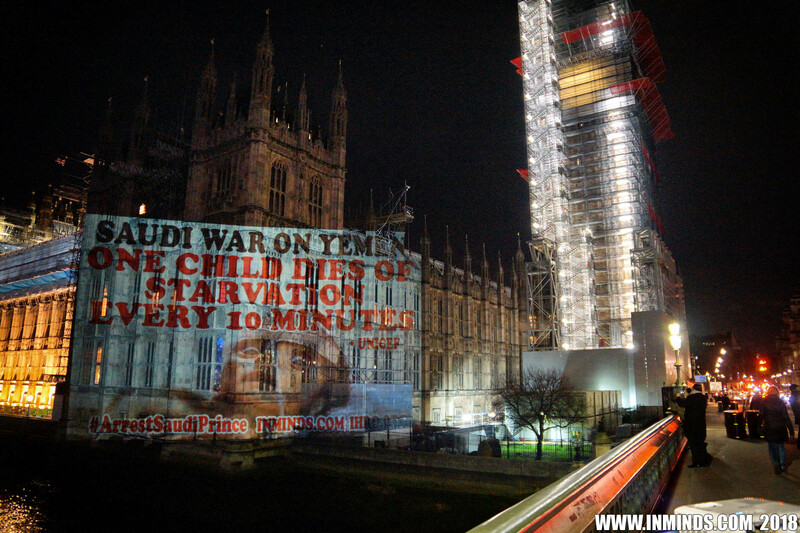 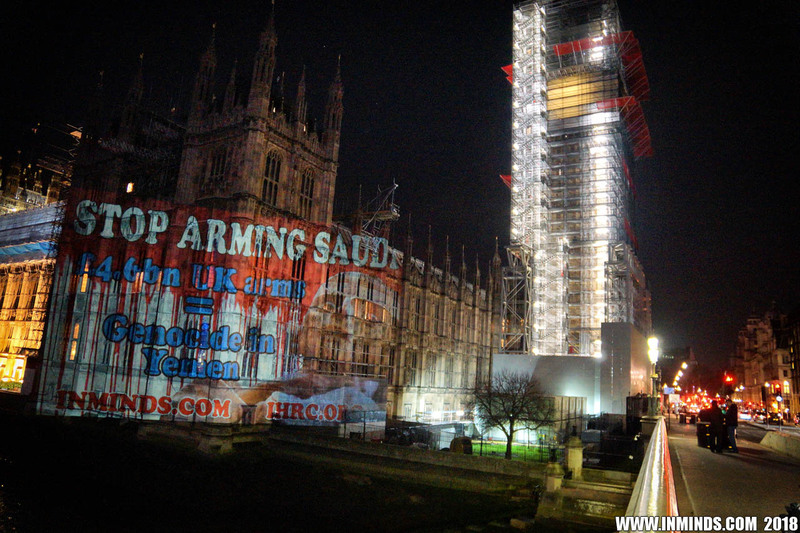 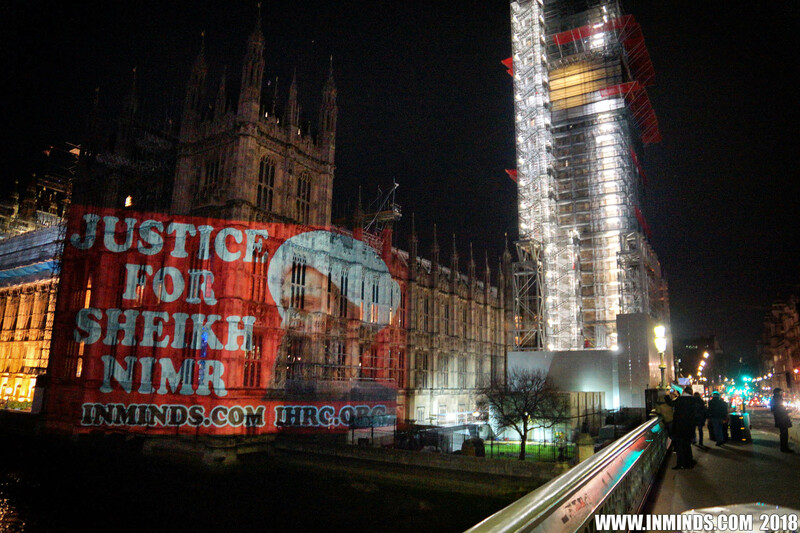 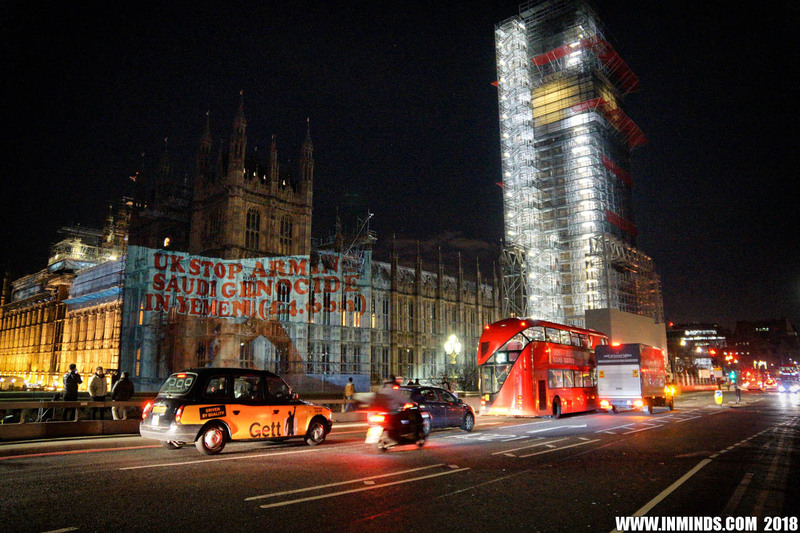 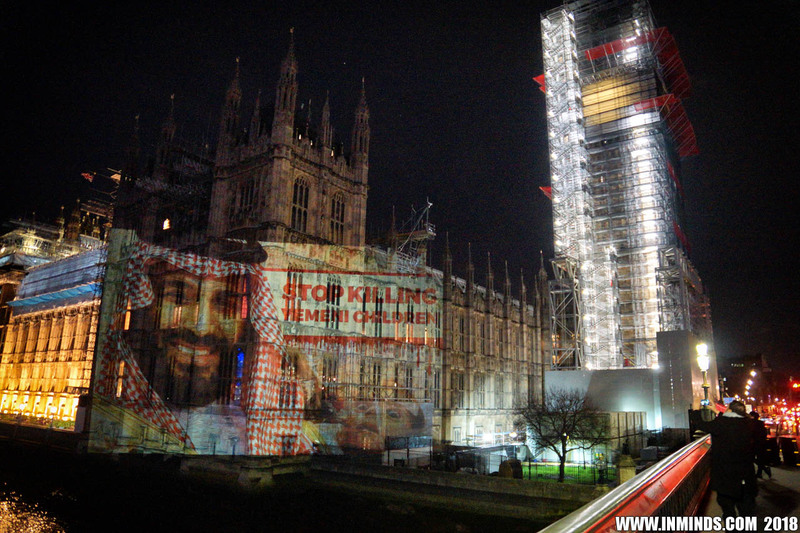 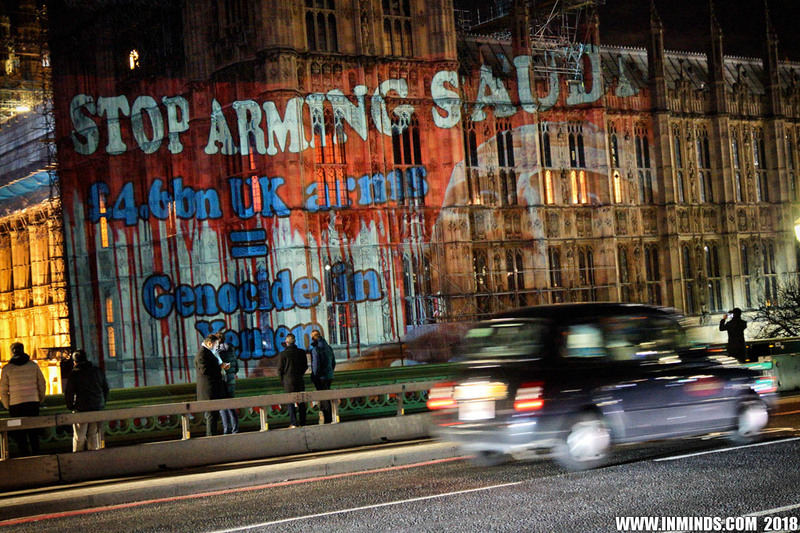 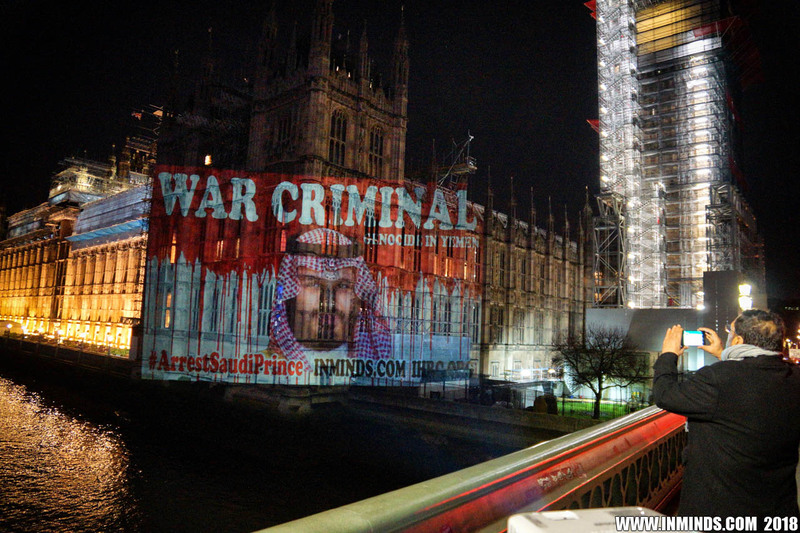 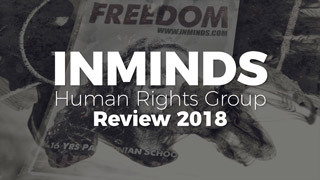 In the early hours of 11th June 2017, as part of a global campaign against 800 days of Saudi genocidal bombing of Yemen, Inminds & Ihrc carried out a guerilla projection on the Saudi embassy in London.